Floral artistry − in both elaborate arrangements or in this case, a single flower − is all about balance and proportion. 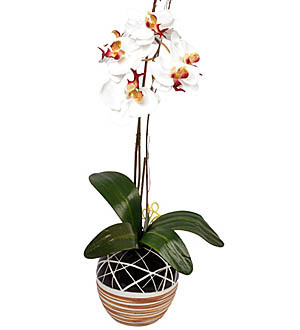 Take this exquisite single-stemmed Phalaenopsis orchid for instance. Achieving a perfect balance between the delicately crafted flower and the simple Spode Vase. Delicate and pretty, this stem of Fleurwood’s Natural Latex Phalaenopsis Orchid Flower is perfect on a simple arrangement. Detailed and beautifully realistic, it adds a wonderful touch of glamour. The real beauty of natural foam flowers is that they last forever; season to season in perfect bloom with no watering, pruning or wilting. At Giftlab we are passionate about imitating nature with absolute precision, and that's why we study real flowers and plants as a reference for each design. The results are blooms so lifelike that even the bees are fooled! Flower Arrangement measures approximately 76cm in height with a diameter of 20cm.